Distance protection. Such non-unit type protections do not have pilots. The discrimination is obtained by co-ordinating the relay settings. Fuses are used in distribution systems, where relays and circuit breakers are not necessary and fuses are preferable due to their low cost, current limiting features etc. The other group of protection of line is unit-type of protection such as pilot wire differential protection, carrier current protection based on phase comparison method ; etc. Separate protection are systems are necessary for earth faults because earth faults are more frequent on overhead transmission line than phase faults, and earth fault currents is different from phase fault current in magnitude. Time and current Graded protection is used where a time-lag can be permitted and instantaneous operation is not necessary, i.e., where time-lag in fault clearance does not cause instability or damage to cables, lines, etc. In addition they are used as a back-up protection to the main unit protection. Distance relaying is employed where time and graded current relaying is too slow or selectivity is not obtained form them. In other words distance relaying is applied for faster protection. In distance relays there are three main types of measuring units, namely : Impedance, Reactance and Mho type distance relays. Each type has certain advantages and disadvantages. For very short lines reactance type is preferred because it is practically unaffected by arc resistance. For short time resistance is large as compared to the line impedance. For medium length lines, impedance relay is suitable but likely to operate wrongly on severe reactive power surges. Mho type relay is used for phase faults of longer lines. Distance schemes comprise starting elements, measuring elements, timer elements. There are tow broad categories called switched and switched schemes. Carrier aided distance schemes include carrier acceleration, carrier blocking and intertripping scheme. Unit protection provides fast selective clearing. Pilot wire protection base on differential circulating current principle (Merz-Price) and other types are used for short lines where cost of pilot wires is not prohibitive. Carrier current protection is used for long lines, interconnected lines. It provides a fast relaying. Radio signals of frequency bans 1000-3000 MHz are used U.S.A for protection of feeders. Auto-reclosure schemes are incorporated in the protection of distribution lines and transmission lines. Auto-reclosure of distribution lines is mainly for improving service continuity. Whereas auto-reclosure of transmission lines is mainly for improving system stability. 2. 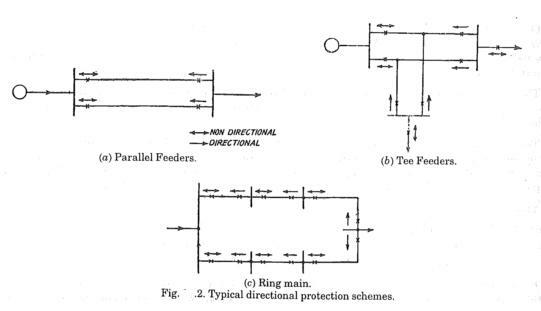 Non directional time graded system of feeder (or line ) protection. In this system the time setting of over-current relays at different locations is graded. Fig. 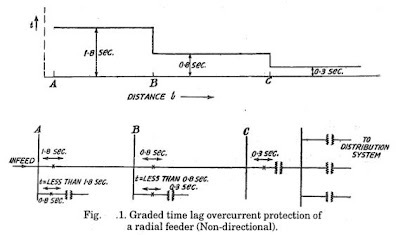 1 illustrated the principle of time graded over-current protection of a radial feeder (line). Fig. 1 shows toe sections of radial feeder connected between station A,B and B,C. The relaying is provided at each station A, B, C, D. The arrow marks pointing towards both direction indicate. That the relays operate for faults on either sides. The time lag is indicated on the arrow head. For a fault beyond station C the circuit breaker at C operates first, i.e., with relay time of 0.3 second. Meanwhile the other relays at station B and A start operating but after about 0.3 second the fault is cleared and the relays at A and B get reset. Therefor for faults beyond C, only the CB at C operates. For faults between B and C only circuit breaker at B operates and likewise.Thus unnecessary tripping is avoided. Secondly by some failure if the relay at B fails to operate, the relay at A provides, back-up protection. This system is suitable for radial feeder in which power flow is only in one direction. Inverse Definite minimum time delay relays are extensively used for obtaining combination of current and time gradlings. Time interval of 0.5 sec is usually found suitable, this covers errors in CT, relay and C.B. operating time. Hence operating times of relays consecutive stations can be0.3, 0.8, 1.3, 1.8, seconds. At sub-station B and A transformers are shown connected to the station bus. The time setting of the relays in this connection should be less than setting of the relays on the main feeder. We graded inverse time protection, the characteristic of relays should be taken into account while setting the relays with inverse relays, the time setting and plug setting can be preset. The fault current is calculated. The time interval of 0.5 second is provided between consecutive relays and operating times are calculated. The plug setting and plug setting are so arranged that for a fault on last section (beyond C ), the desired operating times are obtained. Time graded over-current protection for phase faults and supplemented by time graded earth fault protection. The earth fault relay is residually connected. In general, tow relays are employed for phase faults and one for earth fault. Since both phase fault and earth fault relays are set for short circuits, they do not detect overloads for small magnitude. Overload protection may be provided in addition, with long time setting (minutes) and low current setting. 1. Operate for short circuits in its own line section. 2. Provide back-up protection to the next line section. For a phase relay phase to phase fault is assumed. For an earth fault relay, a single line to ground fault is assumed. TA = TB + CB2 + OA + F.
TA = Operating time of relay at station A.
TB = Operating time of relay A at station B.
OA = Overtravel time at station A.
OA = Overtime = 0.1 second. F = Factor of safety = 0.2 sec. TA = 0.8 + 0.16 + 0.1 + 0.2 = 1.26sec. Hence the time of relay at A should be at least 1.3 second. Overtravel. is the travel of a relay moving elements after the actuating force is removed. This overtravel occurs because of inertia of of moving parts. Overtravel is important feature of a time delay relay where selectivity is obtained by time lag. Overtravel of 0.1 sec is generally assumed for inverse time relays. The next step in co-ordination is adjustment of time lag of inverse time over-current relays to obtain selectivity. The equation given above is used for determining the time setting of relays in the adjoining sections. The procedure of selecting time setting and plug setting is as follows.The time multiplier setting of the relay at remote and from the source is set to a low value, say 0.1. The interval of 0.4 to 0.5 sec is added to select operating times of relays at consecutive stations, as described earlier. Suppose T0 is the required operating time. Where TMS = Time multiplier setting. Tm = Time from relay characteristic for time multiplier setting of 1 and for plug setting equivalent to maximum current. TMS = 1/2 = 0.5. Time lag is to be provided, time lag is not desirable on short circuits. The method is not suitable for ring mains or interconnected lines. It is suitable for radial lines with supply at the one end only. It is difficult to co-ordinate and deeds changes with new connections. It is not suitable for important, long distance transmission lines where rapid fault clearing necessary to ensure stability of systems. To obtain discrimination, where power can flow to the fault from both the directions, the circuit breaker on both the sides should trip, so as to disconnect the faulty lines. Directional time and current graded systems are suitable in each cases. Here the directional relays can operate for fault current flowing in a particular direction shown by arrow —›(Fig. .2 ). In the diagram. the double headed arrow —›› indicates non-directional relay. 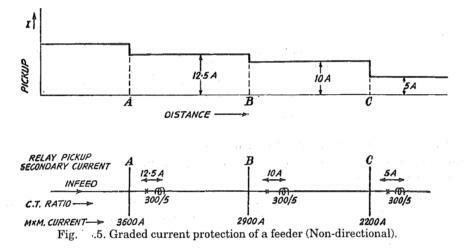 In Fig .2(a) a fault on feeder I will trip only circuit-breakers at the end of feeder I. The circuit breaker at the ends of neighboring feeder (II) would not trip as a main protection. Fig. 3 illustrates the setting of a directional over-current relaying for 3-ph faults. For fault between B and C the relays B2 and C1 operate first and BC is disconnected from the ring main. So, also for the faults on other sections, the faulty section is disconnected from the system. If, in addition to directional over-current feature, time lag is necessary to obtain selectivity, the graded time lag is used. The time lag of directional relays is selected such that it is minimum for relay near the source. Fig. 4 illustrate the principle. An alternative to time grading or in addition to time grading current grading system can be applied when the impedance between tow sub-stations is sufficient and current grading can be applied. The long time delays occurring in graded time lag system can be partly avoided. Current graded systems normally employed high set over-current relays. They operate at per-determined setting without a time lag. Fig. 5 illustrates the protection of a radial feeder with instantaneous over-current relay. For a fault beyond C relay at C actuated. For fault between C and B is actuated. For fault between B and A relay at A is actuated. The current setting diminishes progressively from from the source to the rempte end of tje line. Difference in fault current is low. Magnitude of fault currents can be accurately determined. The accuracy of relay under transient condition is likely to be different. Therefor, to obtain discrimination only about 80% lines protected by relay at one section. Since only 80% of line is protected this system should be supplemented by time graded inverse definite minimum time relay system. 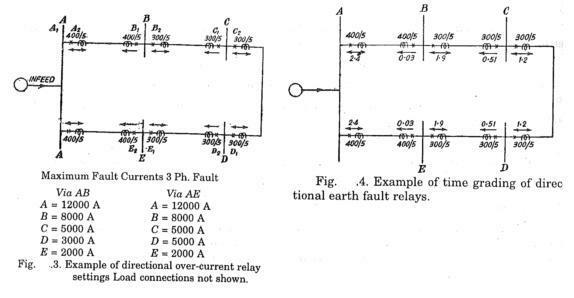 (b) The fault currents for different types of fault are different, This brings a certain difficulty in relay seeting. (c) For ring mains, parallel feeders etc. When power can flow to the fault from either directions, a system without directional control is not suitable. 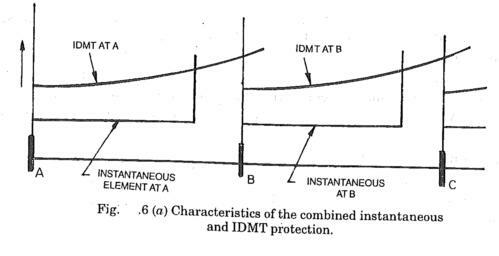 Instantaneous over-current relays in conjunction with inverse definite minimum time (IDMT) relays can be used for high speed protection of radial lines. The coils of instantaneous element and IDMT element are connected in series. Fig. 7 illustrates the characteristic of combination. - The fault level at the sending end of the line is at least thrice that at the receiving end of the line. - The changes in the generation station do not change the fault current significantly. The instantaneous element should be set for than 150% of maximum fault current at the end of the line section which it protects. For example, the instantaneous element at section A should be set for than 150% at maximum fault current at section B. Such a margin takes care of transient and over-reach. Over-reach of Instantaneous Over-current Relay. Where A = relay pick-up current steady state r.m.s value. To take into account the d.c. component, the maximum value of symmetrical value of current foe which the relay should not operate, should be multiplied by about 1.25, to obtain relay pick-up setting. Definite time over-current relays have adjustable over-current elements. When an element picks-up it energizes a built-in time element, which initiates a tripping single after the elapse of the preset time. The tripping time are so graded that the relay beyond the remote station (C) is set at a shorter time than the relays nearer to the power source. This form of time grading satisfactory for simple line configuration with single end in feed provided that the tripping times at power source do not become excessively long. Definite over-current protection is also employed as back-up protection for generator and transformer. The general practice is to use a set of tow over-current relays for protection against interphase faults and a separate over-current relay for single line to ground fault. Separate ground fault (earth fault relays) are generally preferred because they can be adjusted to provide faster and more sensitive protection for single line to ground faults than that provided by the phase. Earth fault current depend on type of natural earthing. Where no natural point is available, grounding transformer is used. In case of resonant earthed system or ungrounded systems, the earth fault currents are minimum. Hence conventional earth fault protection by residual earth fault relays can not give a satisfactory protection. Hence a double actuating quantity earth fault relay is provided at each station. In addition, a directional element is provided to determine in which feeder is the earth fault. The double actuating quantity relay has one voltage coil energized by residual current. In case of resistance earth or solid earthed systems, the over-current element connected in residual circuit of CTs is preferred. The setting of earth fault relays may be less than rated full load current of the line. The earth fault elements are with inverse characteristics and time grading is preferred for earth fault ptotection of radial feeders. Selecting of optimum setting of earth fault relay is difficult. The finale setting is determined by test before commissioning. The procedure for time setting is similar to that over-current relays. However the errors are calculated for each current level and corresponding relays time should be considered. Directional earth fault relays are used where fault power can be supplied from both ends of protected equipment. Fig. 4 illustrates the time graded scheme of ring main based on direction earth fault protection. - Graded time lag over-current protection. In this protection, inverse time relays are employed. This time settings of over-current relays at successive stations are so graded that discrimination is obtained. - Graded time lag or graded that directional over-current protection. - This employed where power flow can be from either sides and simple over-current protection does not provide selectivity. - Protection by instantaneous over-current relays. - Protection by definite time over-current relays. - Separate relays are provided for phase fault protection and earth fault protection. The relays for phases fault protection are co-ordinated independently of relays for each fault. Yes Admin its very helpful to me, your sharing valuable information about in Relay Protection Coordination. So We are providing more information about in power system networks, protection has to be designed such that protective relays isolate the faulted portion of the network, to prevent equipment damage, injury to operators and to ensure minimum system disruption enabling continuity of service to healthy portion of the network. Please visit our website Relay Coordination .